What was the first word you learned in English? I would guess that you learned “good morning,” “my name is…” or “how are you?” first. Thanking people for their kind words or actions is an important part of American culture. That is why, in the United States, there is a whole holiday about saying thanks and being thankful: Thanksgiving. It is all about food, family and being thankful for the good things in your life—and it is one of the most important holidays in the United States. For people who don’t live in the United States, this holiday can seem strange or confusing at first. That’s why we are here today. We are going to talk about the meaning of Thanksgiving, including its history and how people celebrate it now. Our main focus will be Thanksgiving vocabulary. You will learn over 25 words that are specifically associated with Thanksgiving, so that you can impress your friends if you get invited to a Thanksgiving dinner! Before we start learning the vocabulary, let’s do a “lightning round” of Thanksgiving questions, to put the holiday in context. Like many holidays in the United States, the date of Thanksgiving changes every year. However, it is always on a Thursday. Specifically, it is always on the fourth Thursday of November, so this year it is on November 26th. The Internet is full of information and videos about the history of Thanksgiving. The short answer is that Thanksgiving is a holiday that began in 1621. In that year, a group of people from England who had traveled to America were having a very difficult time getting accustomed to their new country. The main reason that people still celebrate the holiday today is because it is a nice time when you can get together with your friends or family to have fun and eat a delicious meal. Plus it is a great excuse for a party! Most people in the United States celebrate Thanksgiving! People from the United States who live in other countries (also called “expats” or “expatriates”) often celebrate with friends or other Americans by having a traditional Thanksgiving dinner. There are some religious holidays (such as Christmas, Easter, Ramadan or Yom Kippur) that are connected to religious traditions or beliefs, but Thanksgiving is generally considered to be secular, which means that it is not associated with any specific religion or denomination. Many people do say prayers at Thanksgiving dinner, of course, but anyone can participate in Thanksgiving. For example, there are Christian Thanksgivings, Muslim Thanksgivings and even Atheist Thanksgivings. Finally, there is also a holiday called Thanksgiving in Canada, but it is celebrated in October and its history is completely different from the American celebration of Thanksgiving. So when we say “Thanksgiving” in this article, it will refer to the celebration in the United States. That’s the main focus of this article, so let’s start going through our Thanksgiving vocabulary words! We’ll start with 10 words that are associated with the holiday, so that you can better understand what the day is all about. Then, we’ll look at 10 common Thanksgiving food words—as you’ll see, for some people, the food is one of the most important things about Thanksgiving! Finally, I’ll share with you 5 bonus idioms and expressions that are related to Thanksgiving words. Many of these words, especially the foods, can be difficult to describe, so I will include links to pages with pictures. Also, for strange words or words that are difficult to pronounce, I’ll include links to a pronunciation dictionary. Enjoy! It’s probably a good idea to start with a general definition of this word. As the name indicates, it is about giving thanks and being thankful for the good things that we have in our lives. Thanksgiving Day is the name of the holiday. As we saw before, there is a holiday with the same name in Canada, and there are also other holidays that celebrate similar ideas in other countries around the world. The American holiday is a little different mainly because of its history, which we will learn more about later. The word Thanksgiving can also be used as an adjective to describe other words, such as Thanksgiving dinner, Thanksgiving break, or Thanksgiving program, for example. Americans also like to say, “Happy Thanksgiving!” to anybody they talk to on Thanksgiving (and sometimes the day before Thanksgiving as well). Example: Thanksgiving Day is on November 26th this year. This word may seem simple, but it can actually become confusing. In American English, the word holiday is used to describe a day that is special for many people, for any reason. Official holidays are special to the whole country and are recognized by the government. These official holidays are celebrated by large numbers of people, so most people are not expected to go to work. Examples of official holidays in the United States include New Year’s Day, Memorial Day, Independence Day, Labor Day and Thanksgiving Day. Many people like holidays in the United States because they get a long weekend. A normal weekend is Saturday and Sunday. However some holidays are on a Friday or Monday, so you will have three days when you do not have to go to work or school, instead of just having Saturday and Sunday. Nice! Some people also use the word “holiday” even if people have to work on that day. For example, many people would say that days like Valentine’s Day, Easter Sunday and Christmas are holidays, but they’re not necessarily “official” holidays. That means that the government has not made them official holidays, so some people may still have to work on those days unless there are special circumstances. That is a basic explanation, but it also gets more complicated since different states within the United States may have different laws related to holidays. Example: It is not an official holiday, but many people still celebrate St. Patrick’s Day on March 17th every year by wearing green and eating Irish food. If you talk to someone who speaks British English, holiday refers to a vacation, or a trip when people travel for pleasure. In American English, that would simply be called a vacation. We would not call a vacation a holiday. Example (American English): We will go on vacation to Brazil next year. Example (British English): We will go on holiday to Brazil next year. A very similar (and similar-sounding) phrase is holy day. A holy day is a holiday or special day that has a religious meaning. Holy means sacred or special in a religious context. Some holy days are Christmas, Easter and Yom Kippur, for example. Example: Good Friday is a holy day in the Christian calendar. It commemorates the day that Jesus was crucified. Finally, a free day or day off can be an informal way to refer to a day when you don’t have to go to work or school, or when you don’t have anything particular to do. A break is usually more than one day off. A settler is a person who moves to a new place to start a new life. The verb for this action is to settle. We’ll see an example of a group of settlers in vocabulary word #5 below. Settlers are also often described as pioneers or explorers. These words express that the settlers have explored a lot of new territory. Sometimes, settlers settle on land that was previously occupied by other groups of people. When that happens, there can be conflicts. Example: As the United States expanded to the west in the 1800s, many settlers moved into new territories and settled on the land. A colony is a territory or area that is controlled by a different country. For example, The United States and Canada were both British colonies, and Brazil was a Portuguese colony. The people who create a colony are called colonists. The place where they create their colony is said to be colonized. Plymouth is the name of a British colony in America. It was in modern-day Massachusetts. It was the location of the first Thanksgiving celebration, so you will often hear this colony’s name when you hear people talking about the history of Thanksgiving. Example: Britain and France had many colonies in Africa in previous centuries. In the context of Thanksgiving, the word Pilgrim usually refers to one of the settlers in Plymouth colony. The Pilgrims in Plymouth were settlers from England who immigrated to America in the early 1600s. We capitalize the word “Pilgrim” when referring to this specific group of people. The Pilgrims were very religious people. They were all Christians belonging to the Puritan or Methodist branches of Christianity. However, one thing all the Pilgrims had in common is that they were Separatists. They did not believe in how their churches were being managed in England, so they wanted to practice their religious ideas freely in a new territory far away from England. Example: The Pilgrims had difficulties with farming when they arrived to America. Another meaning of the word pilgrim is a person who makes a trip to a special religious place. In this case, the word “pilgrim” is not capitalized. The special religious trip made by a pilgrim is called a pilgrimage. Example: Every year, millions of Muslim pilgrims perform the hajj, which is a pilgrimage to Mecca, Saudi Arabia. Most of the Pilgrims who celebrated the first Thanksgiving traveled from Europe to American on a boat called the Mayflower. Native Americans were the indigenous people living in America before colonists started arriving from Europe in 1492. The modern-day descendants of those indigenous people are also called Native Americans. In the past, many people called Native Americans “Indians,” since Christopher Columbus believed he had landed in India. However, this name is not preferred these days because it causes confusion (“Indian” also refers to people from the country of India) and it is not accurate. A group of Native Americans or other indigenous people is usually called a tribe. The name of the Native American tribe that attended the first Thanksgiving was the Wampanoag tribe. Example: Many Native Americans died from diseases that the European colonists brought to America. If you are a farmer, you generally have a farm where you grow plants. Those plants you grow are called crops. When the crops are mature, the farmers need to bring their crops in from the fields so that they can eat or sell them. The action of collecting mature crops is to harvest, and the time is also called the harvest. Thanksgiving originally began as a harvest festival, to celebrate a good harvest after a difficult year. Example: The coffee harvest was not very good last year, so coffee prices went up. A cornucopia can be difficult to describe, but if you see a picture of one, you’ll probably understand right away. It is usually made from natural materials (from the farm or forest) and is woven like a basket. For Thanksgiving, it is filled with all the delicious fruits and vegetables that you collected during your harvest. It is a common symbol of both Thanksgiving and harvest time. Another name for it is horn of plenty (“plenty” means “more than enough”). The word cornucopia can also describe anything that contains a large, amazing variety of things. Example: The toy store was a cornucopia of fun for the little children. There are generally four seasons in the United States. Winter goes from December to March, spring goes from March to June, summer goes from June to September and fall goes from September to December. Fall is the season when Thanksgiving takes place, so many people associate symbols of fall—like falling leaves, cooler weather and orange and brown colors—with Thanksgiving. In British English, fall is called autumn. In the United States, we say “autumn” as often as we say “fall,” so either word is fine to use. Example: It’s been especially cold this fall—I hope that doesn’t affect the harvest. I have been living outside of the US for over 9 years, and one of the things I miss the most is Thanksgiving. I really like to spend time with my family, of course, but I also really miss the delicious food! Many families have different traditions and foods that they eat for Thanksgiving, but there are some foods and related words that are closely connected to the holiday. Let’s learn more about them! A feast is a very large meal. It also is usually a special or fun occasion, like a party where you eat lots and lots of food! Thanksgiving is a feast, but there are other occasions when people celebrate with feasts as well. Example: After the beautiful wedding ceremony, there was a gigantic feast at a very expensive restaurant. In general, a blessing is something that you are fortunate (lucky) to have in your life. It can be a part of your life that is special or that makes you happy. Many people say that their children are blessings, for example. A blessing can also be a prayer that people say before eating a meal. Religious people will often say a blessing before eating a special meal, to show that they are thankful to God that they have so much good food. At Thanksgiving, non-religious people will also say a blessing, to show that they are thankful for their nice food. Example: Before the guests ate the Thanksgiving feast, Jill said a blessing and told everyone that she was happy they could be together. Finally, we’re getting to the food! A turkey is a large, strange-looking bird that people commonly eat for Thanksgiving. 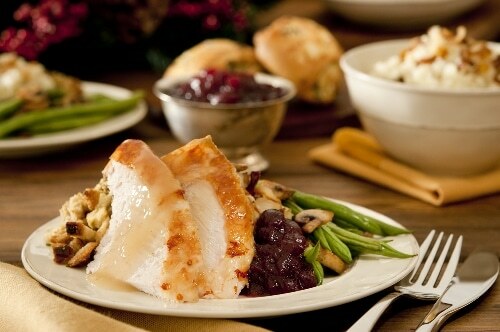 In a recent Thanksgiving in the United States, it was estimated that people ate 45 million turkeys on Thanksgiving Day! If that sounds too violent for you and you do not want to eat turkey, there is also tofurkey, which is tofu (a soy-based product) that is processed to look and taste like turkey! Example: In the past, there were many wild turkeys in America, but now almost all of them are domesticated and kept on farms. Gravy is a sauce that is served with meat. It is usually made from the juices that come out of the meat when it is cooked, so gravy is often brown and tastes similar to the meat it is made from. Example: This gravy is delicious, but I have a feeling that it is probably not very healthy. I’ll need to do a lot of exercise after dinner! A cranberry is a type of small fruit that grows on bushes. It looks similar to a blueberry, but a cranberry is a bit larger and the color is different. Cranberries are generally tart (sour), so they are most often cooked and sweetened with sugar to make cranberry sauce. People eat cranberry sauce with turkey meat. Example: Some people who have not tried cranberry sauce with meat think it sounds strange, but you should really try it—t’s delicious! The combination of sweet and salty flavors is excellent. You probably know what a pie is. It is a dessert like a cake, but thicker, flatter and moister. But you may not know what a pumpkin is. It is a large, orange fruit. When you cook pumpkin, you can use it as filling for pumpkin pie. Pumpkin pie is the most popular Thanksgiving dessert. Many people eat pumpkin pie with whipped cream on top. Whipped cream is just cream that you whip (or beat with a fork or mixer) until it changes from a liquid to almost a solid. Example: I feel full, but this pumpkin pie is so delicious. Well, you only live once, and it’s Thanksgiving—give me another piece, please! And don’t forget the whipped cream! Yams and sweet potatoes are types of tubers, somewhat similar to potatoes. There is a difference between yams and sweet potatoes, but most people don’t know (or care) about the difference. Both are used for typical Thanksgiving foods. People usually cook them and mash them into a puree, adding brown sugar or other sweet ingredients like marshmallows. Example: Those yams look tasty, but could you please serve me the part that doesn’t have marshmallows? They’re too sweet for me. Mashed potatoes are pureed potatoes. People often add milk, butter and salt, but you can add many other ingredients like herbs and spices. Example: For Thanksgiving, people often eat mashed potatoes with gravy on top. When you cook a turkey in the oven, you generally put some ingredients inside the turkey while you cook it. These ingredients are called stuffing (or dressing in some places). Stuffing often includes celery, herbs and cubes of bread, but it depends on the cook’s preferences. Also, some people think it is strange to eat the stuffing that was inside the turkey, so they may cook stuffing separately. Example: There always seems to be a lot of stuffing at Thanksgiving, but never enough gravy. You have probably eaten corn, so I don’t have to give you an explanation of this one. For Thanksgiving, corn is more common as a symbol than as a food, because dried ears of corn are often associated with the harvest time of year. Example: Some families do eat corn for Thanksgiving, but many people are more interested in eating the special foods that are traditionally associated with the holiday. They may just use corn as decoration on the table. Here are some sayings and phrases that are connected to the words above. Example: Let’s take turns and say what we’re thankful for. I’m thankful that I’m healthy and that all of us could be together for this Thanksgiving feast. Example: As a joke, while John was riding the bus he was making airplane sounds and pretending that he was a pilot. He’s a real turkey sometimes. Example: We still need to plan our presentation, but no one has the time or desire to work on it. The presentation is becoming a hot potato, so someone needs to take charge. Example: Now that Tom is a father, he seems to constantly make “dad jokes”—corny jokes that no one laughs at. Example: I don’t want to go anywhere for Black Friday. People go crazy trying to find good sales, but most of the same deals are available online. Okay, so now you have well over 25 new words related to Thanksgiving, so let’s practice with them. Check out this article on Wikipedia’s Simple English entry for Thanksgiving and see how many of the words above you can find and understand. You will probably be surprised that most of them are in that text, and that you can understand them—right? If you have a chance, read some other articles about Thanksgiving on FluentU and other websites. Even better, if you can, try to get together with some friends and family for a Thanksgiving feast, or at least your own personal version of a Thanksgiving feast. If that is too much work, you can at least think about the things that you are thankful for in your life. Personally, I am thankful that you took the time to read this article. I hope you have a great Thanksgiving, even if it is just a small Thanksgiving in your mind.